Dorm rooms aren’t exactly the most aesthetically pleasing spaces in which you’ll have the pleasure of spending a few months of your life. In fact, when you first enter the room that will act as your home for the upcoming semester, you may be downright depressed. 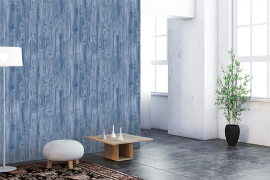 Cinderblock walls, linoleum floors and industrial style used furniture that looks straight out of a prison cell are generally the elements that greet your eyes first. 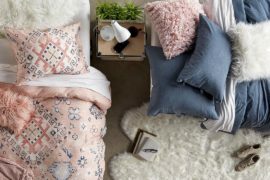 However, there are plenty of ways to transform your dorm space into a cozy and welcoming atmosphere. 1) Choose plenty of bright and bold colors. 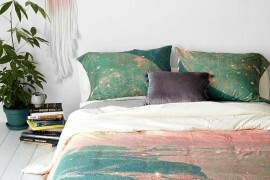 A dorm room is generally void of any and all color, so you’ll need vibrant hues to warm things up. Opt for one or two statement colors and a few less-bold complementing hues. 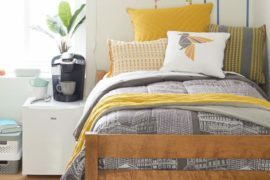 For example, bright pops of marigold yellow will look stunning when paired with grays, browns and toned-down metallics. 2) Select soft textures. Maximize your comfort with a plush down comforter and plenty of mix-and-match pillows to top your bed. Place a thick rug below your bed so it will be the first thing to greet your feet in the morning – instead of that hard linoleum or sealed concrete. Additionally, be sure to have a few additional throw blankets on hand for those chilly late night study sessions. 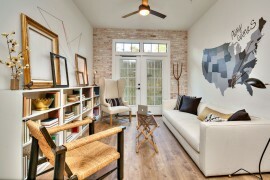 3) Get creative with the walls. Most universities don’t allow students to paint the walls of their dorm rooms, but you can easily decorate in other ways. Hang a tasteful tapestry to take up large chunks of negative space. Create a makeshift headboard with a wall decal or hang a sunburst mirror above your bed for a classy touch. 4) Hide storage in style. 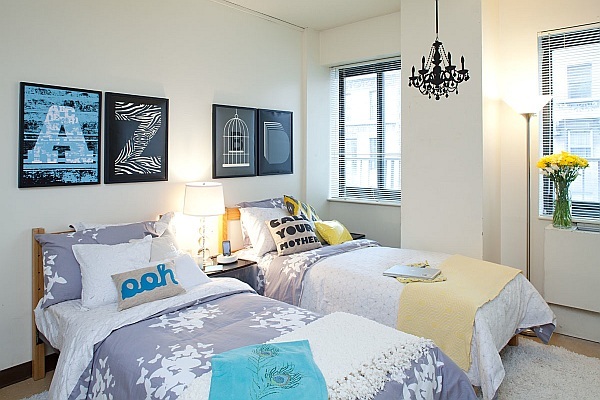 Most dorm rooms are furnished with high beds and door-less closets that allow for extra storage. The only issue is that, with so many things being crammed into these areas, it can look like quite a mess. Hide your unsightly storage space by hanging a few yards of fabric. 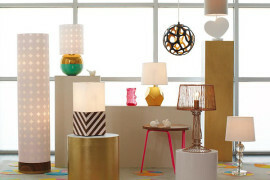 Select a trendy chevron pattern, or funky polka-dots. Whatever you choose, make sure your dorm room adornments match your personality.